The future is bright for female football in Queensland. Last night, six Queenslanders were awarded an All Australian guernsey after starring in the maroon at the NAB AFL Women’s U18 National Championships and again in the NAB Under 18 All Star Game in Adelaide. Of the six, Lauren Bella (ruck) and Serene Watson (defender) have come directly through the SUNS Female Academy program. The half-dozen selections in the All Australian team represent a best ever result for Queensland at the female Under 18 level. AFL Queensland Female High-Performance Manager Craig Starcevich was delighted by the record number of Queenslanders in the side. “This is an outstanding result for Queensland and a great reflection of the strength of our club competitions and the work done by the SUNS and Lions Academies,” Starcevich told aflq.com.au. Bella and Watson were joined by Nat Grider (University of Queensland), Jacqui Yorston (Wilston Grange), Lily Postlethwaite (Moreton Bay), Belle Dawes (Wilston Grange) and Serene Watson (Bond University) to earn All Australian caps. The group of six all featured for the All Stars alongside fellow Queensland state representatives and SUNS Academy members Dee Heslop, Tori Groves-Little and Kitara Farrar in the side’s loss to a combined Victoria side in the All Australian representative game. Lauren Bella was unrivalled in the ruck for the All Stars with a game-high 25 hit outs in a duel with Victoria’s Rene Caris. 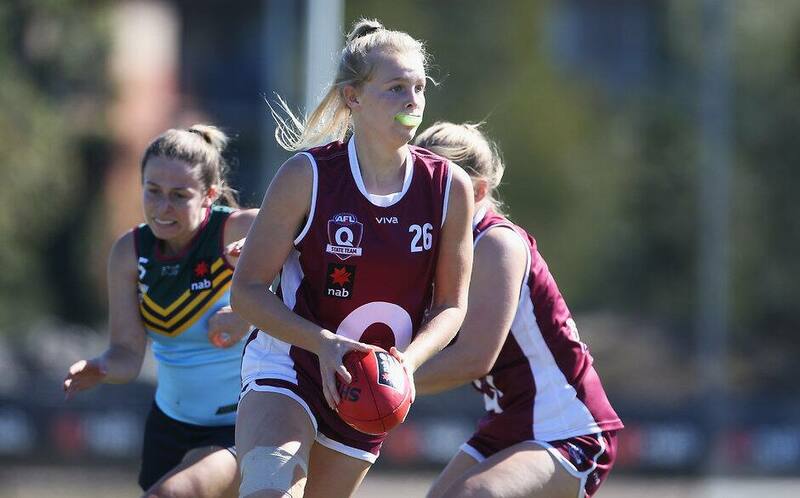 She will attend the NAB AFL Women’s Draft Combine early next month in a bid to join the AFLW ahead of the SUNS’ entry to the competition in 2020.